The kids are on summer vacation and dinner time is starting to loosen up. 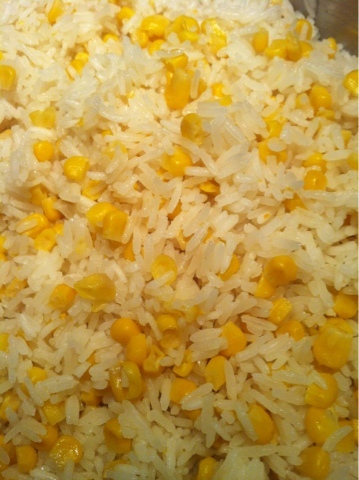 My daughter asked me for arroz con maíz for dinner, which usually means leftover Killer Rice, reheated with a can of corn. Tonight, I felt adventurous and wanted to try to formalize the process, building off the original Killer Rice recipe. The end result was something else. It was Killer Rice with bling. Corn bling. 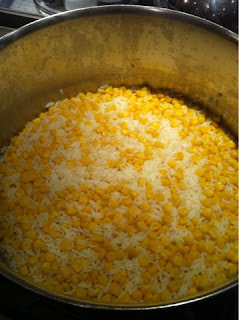 That rice glistened in the corn juice and garlic oil like nothing I've ever seen before. I swear I heard angelic chimes when I lifted the lid. I now present, a La Cocina de Christina original recipe, Arroz con Maíz. 1. Heat the oil in a pot and add the garlic. 2. Fry the garlic until golden on both sides, pressing down gently on the garlic occasionally. 3. Remove the garlic and let the oil cool. 4. 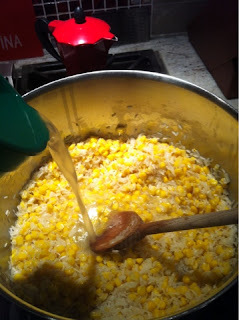 Strain the liquid from the cans of corn and set aside into a measuring cup. 5. Add water to the corn liquid to complete 3 cups, measured. 6. 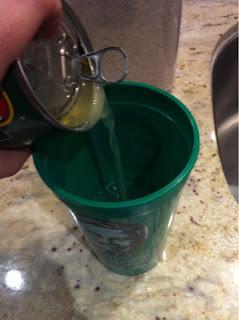 Add 1 Tablespoon salt to the liquid. 7. 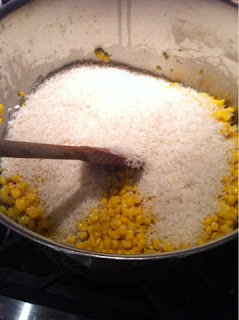 Turn on the heat and add the corn and dry rice to the oil in the pot, tossing to coat thoroughly. 8. Add the liquid to the pot, stirring a few times until completely boiling. 9. Cook on low, covered for 30 minutes.